Here are the organic flours and mixes I received. I was delighted when I had the opportunity to work with Great River Organic Milling Company and the wonderful selections of products they provided for this review. I believe to maintain optimum health it helps to fuel your body the right way with the type of nutritious whole grains, flours, cereals and mixes that this company sells. 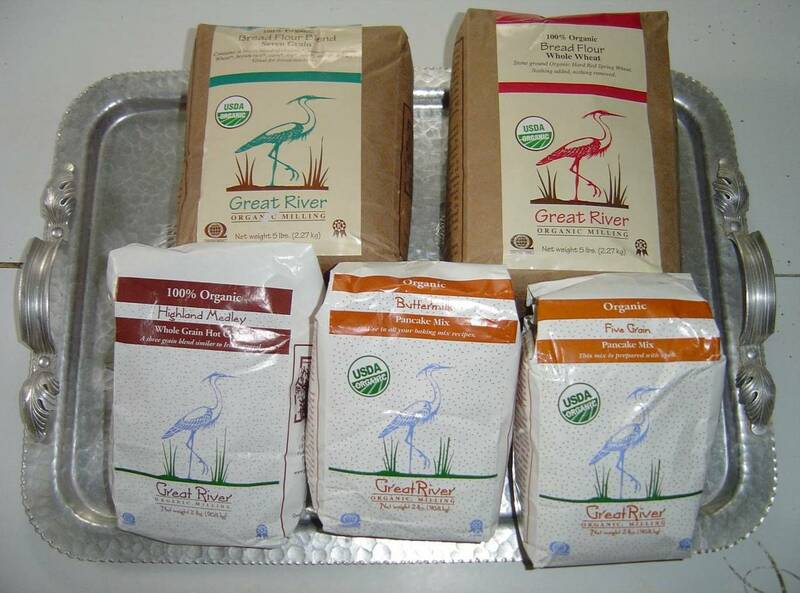 Great River Organic Milling Company takes great pride in making sure their products are grown in healthy soil void of chemical fertilizers and pesticides to preserve the environment and the delicate balance of nature to produce quality products for both taste and nutrition. What sets this company apart aside from being certified organic by Quality Assurance International and Kosher approved to meet rigorous standards are their natural granite millstones. These millstones grind their whole grain flour into stone ground to give it that superior distinct flavor. I was sent their 100% Organic Bread Flour Blend (Seven Grain), 100% Organic Bread Flour Whole Wheat, Organic Buttermilk Pancake Mix, Organic Five Grain Pancake Mix, and Highland Melody Whole Grain Hot Cereal. 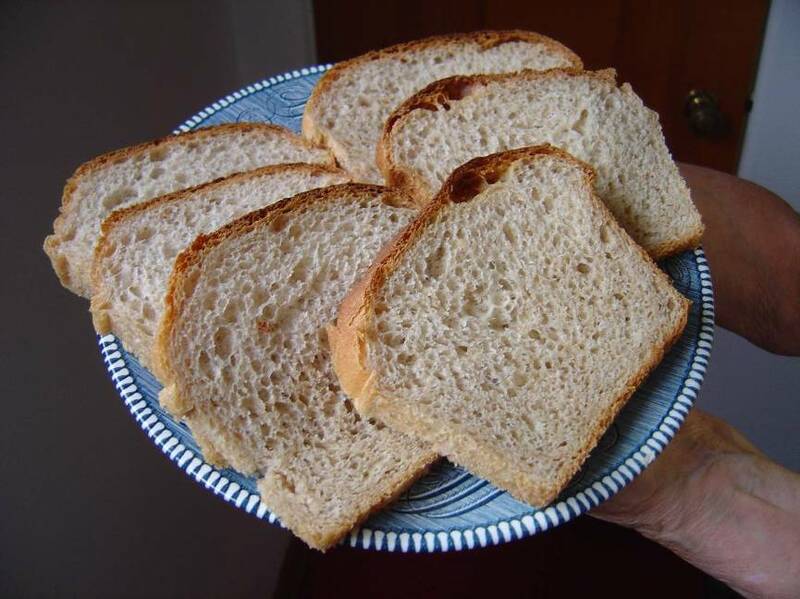 The first thing I decided to make was a recipe of whole-wheat bread by hand. I do not own a bread machine or see a need for one. However, if you have one, then these flours are advertised to work well in them. I do not like to use straight whole wheat flour because it makes my bread too heavy. Instead, I use less than half whole wheat flour to the white. This always worked out better to produce a lighter, less dense bread with a better texture. 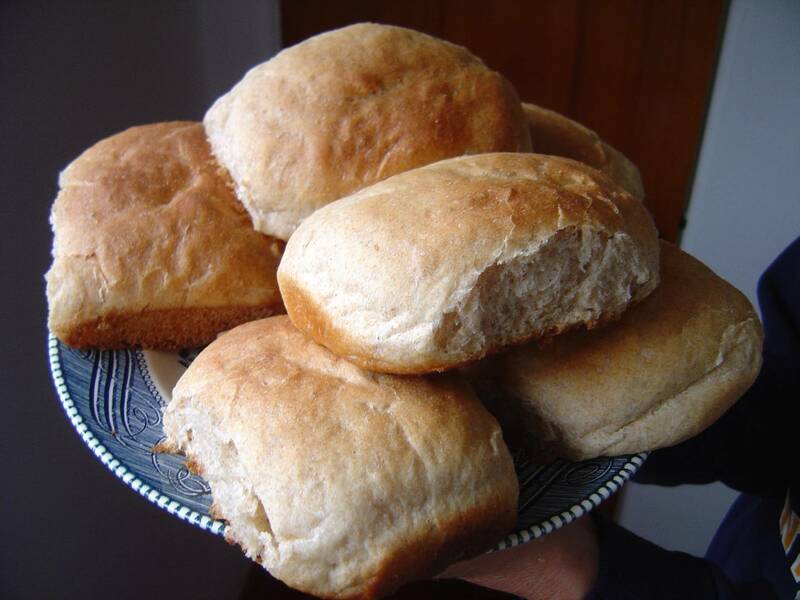 I also experimented with their Seven Grain Flour Blend for a batch of delicious homemade buns using the same Whole Wheat Bread recipe with a simple substituion of their Seven Grain Flour Blend. The only other thing that changed was the baking pans. Dissolve your yeast in 1/2 cup of your very warm water (not scalding). Test the temperature on your wrist. Add a teaspoon of your measured sugar to the yeast water to help it bubble up. Sift your whole wheat, and half the white flour, sugar, salt into a large mixing bowl. Put the rest of your warm water, oil, and bubbly yeast and mix thoroughly, adding more white flour as needed until it doesn’t stick. Knead in your same large mixing bowl or on a floured surface for about five minutes until soft and pliable. Cover and let grow for about an hour and half. Punch down. Turn out onto a floured surface again and roll or shape into three loaves. Bake at 375 degrees for about 40 minutes. Here’s the texture of my Whole Wheat bread once sliced. Here I made some Whole What bubns from from the same recipe. 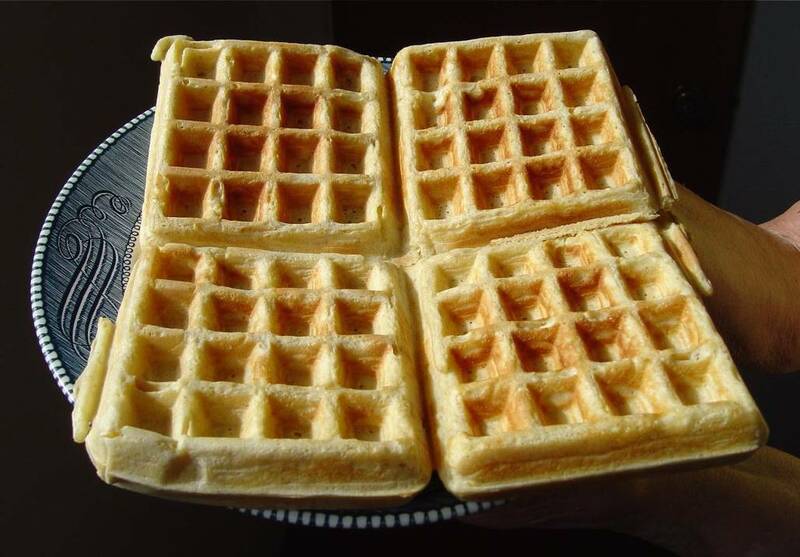 One morning I made the Organic Buttermilk Pancake Mix in my Belgian Waffle Maker. This was really easy and made a great breakfast. Though I must say, these yummy waffles were more filling than normal. Here’s the waffles I made from their Organic Buttermilk Pancake Mix. Another day I tried the Organic Five Grain Pancake Mix into pancakes that time. This five grain mix also was very good, and honestly, extremely filling compared to conventional pancakes. Mothers, you’ll smile when you watch how quickly your children clean their plates and yet they don’t know what they ate was nutritious–only delicious. Finally, I cooked a pot of the Highland Melody Whole Grain Hot Cereal. This is like Irish Oats. However, for those of you unfamiliar with Irish Oats, I will tell you that these oats have more of a texture like a cooked rice. We added just a little milk and sugar like our normal old-fashioned cooked oatmeal and loved the tasty difference. Everything I sampled here was wonderful and highly recommend Great River Organic Milling. Find them on Facebook, or visit their website and online storefront or purchase on Amazon.